Healthy Children > Health Issues > Conditions > Ear Nose & Throat > When is a Sore Throat a More Serious Infection? When is a Sore Throat a More Serious Infection? Sore throats are common in kids. However, it can be difficult to sort out when your child has a sore throat that will get better on its own, or one caused by a more serious infection. Here's some information on common infections that may include a sore throat. Sore throats are most often caused by a viral infection like the common cold. These illnesses show up more commonly during winter but can happen year-round. In addition to a sore, scratchy throat, a cold virus can cause your child to have a fever, runny nose and cough. Antibiotics will not help a sore throat caused by a virus. These infections usually get better without medication in 7 to 10 days. The best way to care for a cold and sore throat is to help keep your child comfortable and make sure he or she gets plenty of fluids and rest. Hand, foot, and mouth disease is caused by a family of viruses called enteroviruses. This infection most often spreads among young children during summer and fall, although cases may occur year-round. Early symptoms may include fever and sore throat or mouth pain, followed by a rash that appears as a mix of small red bumps and blisters, particularly on the hands, feet, buttocks, and around the mouth. Blisters and sores may form in the mouth and throat, making it painful to swallow. As with other viruses, antibiotics will not help this type of sore throat. Your pediatrician may recommend acetaminophen or ibuprofen for the fever and pain, along with fluids and rest at home until the blisters heal. Strep throat is an infection caused by the bacterium Streptococcus pyogenes. It's most commonly seen among children 5 to 15 years old, usually during winter and early spring. 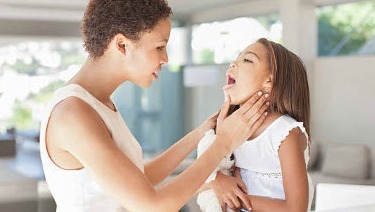 Only 20% to 30% of throat infections in school age children are caused by strep throat. Symptoms include sore throat, pus on the tonsils, difficulty swallowing, fever, and swollen glands. Children may also complain of headaches, stomachaches, and may develop a red, sandpaper-like rash on their bodies. Cough and runny nose are NOT typical symptoms of strep throat among older children. Strep throat is extremely uncommon in infants and toddlers. When they do get strep, though, their symptoms may be different. Your pediatrician will prescribe antibiotic medicine for strep throat. The cause of sore throats in children usually is viral infections, which do not benefit from antibiotics and go away on their own. Children with strep throat also may also recover without antibiotics. However, antibiotics can speed up recovery time, reduce contagiousness, and lower the risk of developing certain complications from strep throat. The most important complications to avoid include acute rheumatic fever, a disease that can damage the heart and joints. Antibiotics are important for treating bacterial infections like strep throat but have their own risks, including diarrhea, yeast infections, allergic reactions, and the development of antibiotic resistance. That's why it is important to know when antibiotics are necessary for sore throat and when they are not. Your pediatrician can diagnose a sore throat caused by a virus after examining your child and ruling out a bacterial infection. The best way to care for a sore throat caused by a virus is to keep your child comfortable and making sure they get plenty of fluids and rest. Your pediatrician may recommend acetaminophen or ibuprofen to relieve the fever and pain. For hand, foot and mouth disease, which is highly contagious, your child should stay home until the blisters begin to heal. If your pediatrician is concerned about a possible strep throat infection, he or she may swab the back of your child's throat to collect a test sample. Most pediatric clinics can do a rapid strep test, which gives results within about 10-15 minutes and can detect most cases of strep throat. If this test is negative, the pediatrician may send the sample to a lab where they will try to grow the bacteria. If either test is positive, your child may be diagnosed with strep throat. If both tests are negative, your child does not have strep throat. The viruses and bacteria that cause a sore throat are passed from person to person through droplets of moisture in the air (from a sneeze or cough) or on the hands of someone who is infected. The illnesses may spread through schools and child care centers. One challenge for prevention is that people are often most contagious before they even begin to have symptoms. Washing hands, covering coughs and sneezes with a tissue or upper arm (rather than hand), cleaning toys, and not sharing drinking cups is the best way to try to prevent the spread of illness. If your child complains of a sore throat that does not improve over the course of the day―especially after drinking water―you should call your pediatrician. This is especially true if there there's a fever, headache, stomachache, drooling (because it hurts to swallow), or signs of dehydration. Your child's pediatrician may want him or her to come in for to determine if a strep test is needed. If your child tests negative for strep throat or if your pediatrician does not think your child needs a throat swab, that is great news. Your child most likely has a virus that will get better with time. However, if his or her symptoms don't get better after 3 to 5 days, or if they develop other symptoms such as an earache or a new fever, he or she should see the pediatrician again to determine if more tests are needed. Antibiotics for a Sore Throat, Cough or Runny Nose? Nicole Bentley, MD, earned her medical degree from the University of Iowa Carver College of Medicine. She is currently completing a pediatric residency program at the University of Wisconsin. Upon completion of residency, she plans to practice primary care pediatrics. Within the American Academy of Pediatrics, she is a member of Section on Pediatric Trainees (SOPT) and the Wisconsin Chapter.